PONCE DE LEON, Fla— The Walton County Sheriff’s Office is actively seeking information on the whereabouts of a Ponce de Leon man following hatchet attack. At 7:36 PM on Monday, October 15, 2018, Walton County Sheriff’s Office deputies responded to a call in reference to an armed burglary and aggravated assault at the 300 block of Hogan Loop in Ponce de Leon. The victim stated Rokelle Ka’Shayne Quavosier Jackson, kicked in the front door of his Florida room and attacked him with a hatchet. After a short struggle, the victim was able to force Jackson out of the Florida room. Jackson then slashed all four tires on the victim’s vehicle. As the suspect came out from around the back of the vehicle, the victim swung a crowbar at the suspect, smashing in the windshield of Jackson’s car. Fortunately, the victim only suffered minor injuries from the attack. The suspect fled the scene in a 2002 white four-door Cadillac with a busted out windshield. There is a Florida license plate attached to the vehicle that reads JTM-Z16. 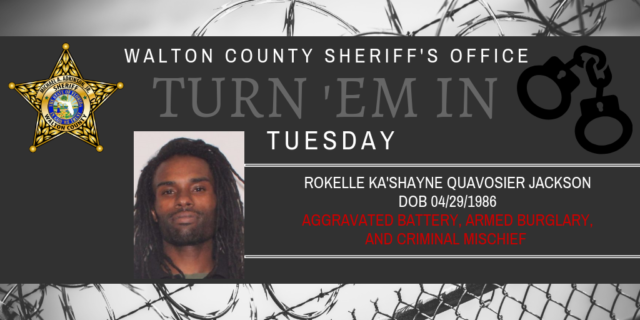 Rokelle Ka’Shayne Quavosier Jackson, 32, of Ponce de Leon has an active warrant for Aggravated Battery with a Deadly Weapon, Armed Burglary, and Criminal Mischief over $1,000. Anyone with information on Jackson’s whereabouts is asked to call the Walton County Sheriff’s Office at (850) 892-8111 or you can remain anonymous by calling Emerald Coast Crime Stoppers at (850) 863-TIPS. Submit a web tip at http://www.emeraldcoastcrimestoppers.com/ or send a mobile tip using the P3 Tips Mobile Application or the Walton County Sheriff’s Office smartphone app. You could be eligible for a cash reward. Be the first to comment on "WCSO SEARCHING FOR PONCE DE LEON MAN FOLLOWING ATTACKING SOMEONE WITH A HATCHET"